Thoughts on food, family, and faith – and anything in between. Salads are a wonderful treat all year long, but summer lends itself to some particularly wonderful mixtures of fresh vegetables and fruits. This is one I made today for lunch, and it was so good – healthy too. 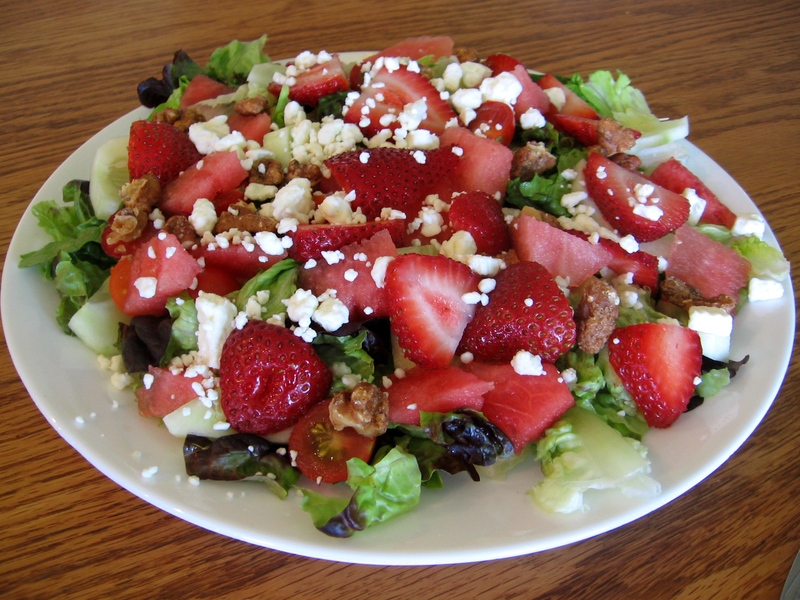 I started with a layer of red and green lettuce, cucumbers and tomatoes from the garden, diced watermelon, sliced strawberries, spiced walnuts, and feta cheese. This was topped with a drizzle of cherry balsamic vinegar – a much healthier option than the typical salad dressing. I didn’t have any red onion, or I would have added that too as I think it would have been a nice complement to the salad. Yum!